J.D. Fitzgerald A culinary JTED class at Mountain View High School. Good news on the JTED front: Legislation to restore nearly all of the funding to the state's Joint Technical Education Districts appears to be on the move. 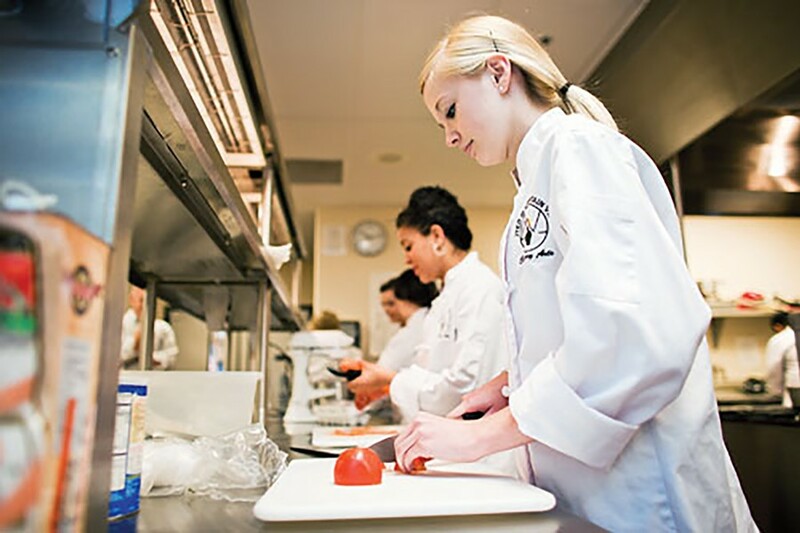 The JTEDs—which provide career and technical education to high school students so that they care about staying in school and graduate with useful skills in the marketplace—have proven to be successful; somewhere around 96 percent of kids enrolled in at least two JTED programs before graduating from high school. But, as The Skinny noted a couple of weeks ago ("Technical Issue," Jan. 28), state lawmakers slashed the program by $30 million when crafting this year's budget. To their credit, most lawmakers have realized that they might have made a gigantic mistake and are working to reverse the cuts. But there's always a fly in the ointment and Senate President Andy Biggs has been providing some pushback against the effort, saying that JTEDs have expanded too much into areas they shouldn't be providing instruction. And Gov. Doug Ducey has said that if the funding is restored, lawmakers will have to cut somewhere else because a balanced budget is more important than a successful program that keeps kids in school. Still, Biggs has come around to supporting legislation sponsored by Sen. Don Shooter (R-Yuma) to restore nearly all of the $28 million in funding along with some reforms in what classes are offered. Biggs called Shooter's bill "a responsible and effective restoration and reform package." The House version of the legislation, HB 2642, passed unanimously out of both the House Education and the House Rules Committee on Monday, Feb. 8, and was on its way to a vote of the full House. Looks like the A-10 will continue flying over Tucson skies for several years to come. Last week, Defense Secretary Ash Carter announced that plans to retire the A-10 had been delayed until at least 2022. Carter said in an announcement the Obama administration's new budget plan "defers the A-10's final retirement until 2022, replacing it with F-35s on a squadron-by squadron basis so we'll always have enough aircraft for today's conflicts." The A-10—which is unparalleled in close-air support, which means it can fly in low to help troops on the ground—has been seeing a lot of action in the ongoing efforts to destroy ISIS strongholds in Iraq and Syria. The Obama administration had been pushing to retire the A-10 to stay within the spending limits set forth by the sequester, a crazy deal made by lawmakers that required them to make big cuts in defense and domestic spending because they couldn't come up with a better budget plan. The decision to keep the A-10 flying is a big relief in the Tucson community because Davis-Monthan Air Force Base, which provides an estimated $1.6 billion budget boost to the Tucson economy, is the top training ground for the A-10. Had the plane been retired, D-M's future was in jeopardy. It was also a big win for Congresswoman Martha McSally and Sen. John McCain, who had been pushing back against plans to retire the A-10. "The A-10 is critical to our national security," McSally said in a statement to the press. "It continues to demonstrate its value on the battlefield against ISIS, in Europe to deter Russian aggression, and on the border with North Korea." McSally said that 2022 was still too soon to stop flying the jet. "Make no mistake: this is still an early retirement," McSally added. "We've recently invested $1 billion into our A-10 fleet to keep it flying until at least 2028. No other plane can perform the tasks for which the A-10 is uniquely suited and no other weapon system we have has the same ability to protect troops' lives on the ground. I'll continue to lead the fight to ensure we keep the A-10 until a suitable alternative yet to be identified is developed, tested, and proven to do the mission." McCain campaign spokeswoman Lorna Romero credited Arizona's senior senator for saving the warplane. "For the last several years, John McCain has led the fight to prevent the Air Force from prematurely retiring the A-10 fleet and has once again succeeded in protecting this critical asset to our military and to Southern Arizona's economy," Romero said. "John McCain recognizes the importance of the A-10 fleet in the fight against ISIS in the Middle East, assisting NATO's efforts to deter Russian aggression in Eastern Europe, and supporting U.S. national security missions across the world." If you want to vote in Arizona's March 22 presidential primary, you have to be registered with either the Democratic or the Republican Party by Feb. 22. Independents can't just pick a party and request a ballot as they can in the regular federal, state and local contests. You can take care of the paperwork at a bunch of places—libraries, post offices, City Hall—or online at servicearizona.com. Keep in mind that this may be your last chance to vote in a state-sanctioned presidential primary in Arizona: There's a move afoot at the Capitol to get rid of the state's presidential primary and let the parties figure it out on their own. Zona Politics with Jim Nintzel airs at 8 a.m. Sunday on the CW Tucson, Channel 8 on Cox and Comcast and Channel 58 on Dish, DirecTV and broadcast. You can hear the show on KXCI, 91.3 FM, at 5 p.m. Sundays or watch it online at zonapolitics.com. This week's guests include UA engineering professor Kimberly Ogden, who will talk about carbon sequestration and alternative energy ahead of her Feb. 29 lecture in the UA College of Science spring lecture series on climate change; author Tom Prezelksi, who will discuss his book Californio Lancers: The 1st Battalion of Native Cavalry in the Far West, 1863-1866; and author Megan Kimble, who will discuss her book, Unprocessed: My City Dwelling Year of Reclaiming Real Food.